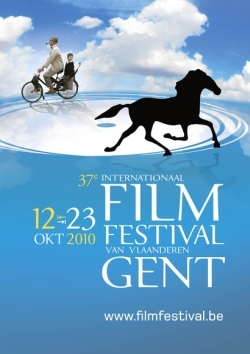 Ghent hosts Belgium's biggest film festival from 12 to 23 October. While the previous editions centered around a theme (last year this was China), 2010 is a more general festivity of films, but still with a focus on world cinema and arthouse. This all combined with lots of film music: an exclusive John Barry in Concert, the tenth edition of the World Soundtrack Awards and a seminar with Stephen Warbeck. Elliot Goldenthal, Howard Shore, Gabriel Yared and Craig Armstrong are some of the guests who will have their music performed. Smoorverliefd, a Flemish romantic comedy by director Hilde Van Mieghem, opens the festival. The closing film is Sophia Coppola's Somewhere, for which she got the Golden Lion award at the last Venice Film Festival. In between, there's a variety of choices and parcours, from world cinema to more familiar titles that will have their Belgian première. The festival ends again with the World Soundtrack Awards. This year's 10th edition is a celebration of its whole history. With 10 invited composers, who were present in these past 10 editions, along with Discovery of the Year 2009 Nico Muhly, bringing their favourite selections, it is sure going to be an impressive finale. On October 20th, the Ghent Film Festival and Hogeschool Ghent are organising a film music seminar with composer Stephen Warbeck (Shakespeare in Love, Billy Elliott) at which he will present his working method, illustrating it with music and film clips. The seminar will take place at the Zwarte Zaal of KASK (Bijloke site) from 10 am to 4 pm. The main question is 'How does film music contribute to the narrative structure of a film'. 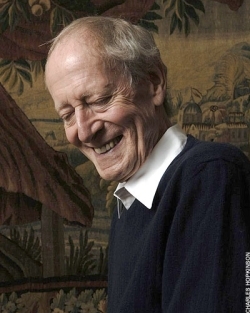 Five-time Oscar winner John Barry will receive a Lifetime Achievement Award, which will be accepted by David Arnold because the composer himself is unable to travel due to sickness. To celebrate this composer, the 80 members Brussels Philharmonic will be performing selections from many of Barry's classic scores including Goldfinger, Mary Queen of Scots, Out of Africa, Dances with Wolves and Midnight Cowboy, conducted by Nicholas Dodd. As always, the concert will be accompanied by a video presentation of film clips. 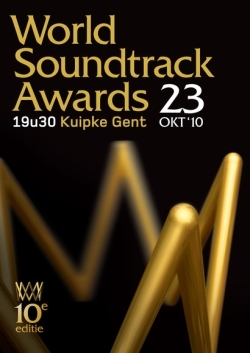 The World Soundtrack Awards, an awards presentation honoring the best in film music established by the Ghent International Film Festival's World Soundtrack Academy in 2001, has announced an all star line up to usher in its 10th year. Ten world class composers will be appearing live in concert at the awards presentation in Ghent, Belgium on October 23rd. Those confirmed include Oscar winners Howard Shore (Lord Of The Rings trilogy), Elliot Goldenthal (Titus, Interview With A Vampire), Gabriel Yared (The Talented Mr. Ripley), Gustavo Santaolalla (Babel, Brokeback Mountain), Stephen Warbeck (Shakespeare In Love) as well as Angelo Badalamenti (Twin Peaks), Craig Armstrong (Elizabeth: The Golden Age, Ray), Alberto Iglesias (The Kite Runner, Volver), Bruno Coulais (The Chorus), Frédéric Devreese (Un Soir, Un Train). Nico Muhly was awarded Discovery of the Year in 2009, and is attending this year's edition to bring us music from The Reader. Other guests will be announced later on this page or on our forum. Shigeru Umebayashi was the guest of honor last year at the 36th edition of the Ghent Film Festival. The composer performed two sold-out concerts of film music in Vooruit which are unforgettable. The ever-smiling composer also held a film music seminar about sound and the use of music in contemporary Chinese films. He is a famous member of the World Soundtrack Academy and has written the scores for more than forty Japanese, Chinese and international films. He combines flexibility and passion with elegance. In his opinion, these are the two most important qualities of a composer. Under the direction of conductor Dirk Brossé, the Brussels Philharmonic - the Orchestra of Flanders recorded sixteen numbers that paint a powerful picture of Umebayashi's work. Following their execution of works by Craig Armstrong, Mychael Danna and Angelo Badalamenti the Brussels Philharmonic - the Orchestra of Flanders offered yet another brilliant interpretation this time of the scores of Umebayashi. The album includes music from 2046, Zhou Yu's Train, Curse of the Golden Flower, Incendiary, In The Mood For Love, Hannibal Rising, House of Flying Daggers, Tears For Sale and Sorekara. One of his most famous soundtracks, 'Yumeji's Theme', is also featured on the CD. This score represented an international breakthrough for him when it featured in the film In the Mood for Love by Wong Kar Wai. This score was used again by Wong Kar Wai in My Blueberry Nights. Umebayashi could be considered as the in-house composer of the famous Chinese director.